Much against my better judgement KenR persuaded me out to the Via Ferrata in Crolles. It is supposed to be one of the hardest in France. Luckily there is a “kids” route which Ken took for a warm up before a solo on the main event. We took the Funi up to the mid-way station then climbed a short path for 20 minutes to the base. The first part of the climb is common, the Pilier du Belvédère. This route has a couple of minor overhangs and is very vertical. There is a little ledge about 2/3rds up where you can rest if you wish. From the top of the Belvédère a horizontal shelf called the Vire à vélo takes you to the base of the Grand Dièdre (red line), a 150 meter vertical pillar with an overhang early on. This is the hard route, Ken climbed it in the afternoon as it goes into shade around 2.30pm this time of year. This is the section which saw a fatality in May and there have been 4 deaths on the route. Ken suggests you should be indoor climbing 5c/6a before attempting it, at least without a qualified guide. We tracked right (north) under the waterfall to the Vire des Lavandières. You can walk out here to the main hiking trail if you wish. The Lavandières is as hard as the Pilier du Belvédère in a couple of spots but is less sustained. There is a complicated traverse/overhang half way up the pitch and the exit to a ladder is a short overhang where you have your feet on well polished rock. From the ladder you can hang right to rejoin the hiking trail via two bridges and the top of the funiculaire is 15 minutes walk. If you get the 10am tram you should be able to make the 12.30 return (the last tram before a lunch break) otherwise you can eat on the plateau. 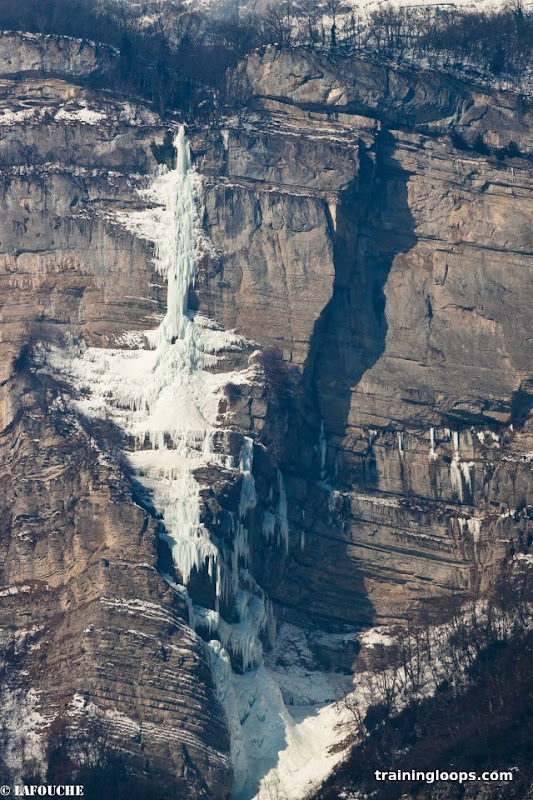 The cascade was climbed this winter by Erwan Lelann and Arnaud Guillaume. The first time Erway has seen the cascade sufficiently frozen to attempt a climb. Wow - thanks for putting up all those great photos, with your usual helpful descriptions. * the “difficult” Via Ferrata which David and I did together in the morning, La Vire des Lavandieres, is a nice route, with a variety of moves at different angles, including some overhanging moves. 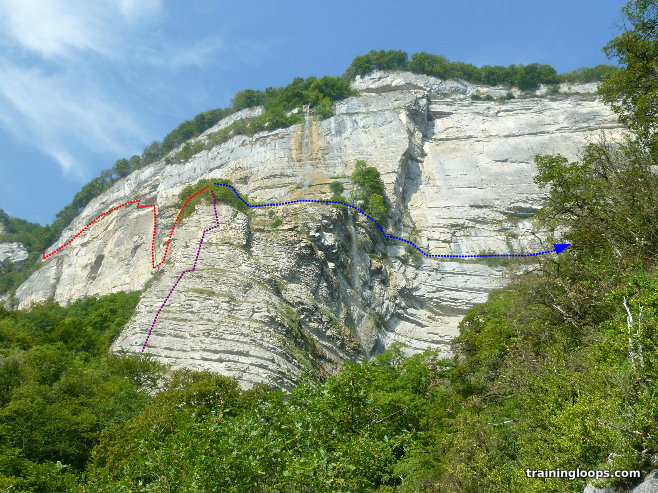 Special features are visiting the base of the waterfall and also a secluded pool above it, and a long traverse along a horizontal ledge (opportunity to experience a sangle of the Chartreuse mountain group). According the cog railway website, I guess there is at least one hiking trail which give access to experience the sangle but without going thru any overhanging moves. * unless you have a strong need to do a lot of steep hiking up and down, purchase a ticket to use the cog railway—they sell a specific ticket for Via Ferrata climbers. * the Grand Diedre (great dihedral) is Super-Difficult, and a remarkable + impressive feature to climb. I’ve done many hard via ferrata routes in the Dolomites + Austria + France, never experienced anything like it. Very exposed, very strenuous, very sustained. * I do recommend being able to do rock-climbing at 5c/6a before attempting it (meaning French rock-climbing grades, not UK rock-climbing difficulty scale). I’m not claiming there is some single move as hard as 5c. But there might be several moves toward 5b, and the whole thing is very sustained. And generally falling with a Via Ferrata kit has a greater risk of injury than falling with a rock-climbing rope belay. While the equipment installed on this route is currently rather good, getting rescued off a big vertical wall is never a simple thing. * Because the difficulty of the Grand Diedre is so sustained, I also recommend carrying equipment specifically designed for resting in the midst of an overhanging route - (for me that’s a big carabiner at the end of a leash/longe/"cow’s tail” about 50cm long, which I can connect to my harness belay loop with a larksfoot (US “girth hitch)—and have practiced using it on strenuous VF routes before. Also practice in quickly efficiently unclipping + re-clipping the two lanyard arms + carabiners of a normal Via Ferrata kit, while hanging out from the rock on one hand + arm (there are some tricks to this). The worst time to fail + fall is just before re-clipping at the next higher cable anchor—but that’s also just when you’re making the most strenuous move (on one arm) and likely the longest time since your last rest point.